Frederick Horsman Varley (1881-1969) was born in Sheffield, England. After studying painting in Belgium, he immigrated to Canada in 1912. He settled in Toronto where he worked as a commercial illustrator. It was there that he met the future members of the famous Group of Seven and began painting landscapes in Algonquin Park. In 1918 the Canadian government engaged him as a war artist. He travelled to England and then to France and Belgium where he produced many paintings depicting grim scenes from the Western Front. Some of his best known war paintings are For What?, Gas Chamber at Seaford and German Prisoners on the Western Front. Although Varley had been enthusiastic about working as a war artist, he became deeply disturbed by what he saw and his work reflected this. He returned to Canada at the end of the war, and in 1920 became one of the founding members of the Group of Seven. Another member of the group, A.Y. 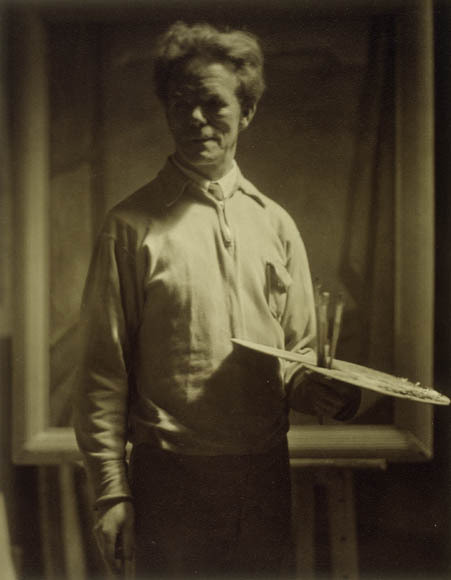 Jackson, also served as an artist in the Great War. Description: Grey eyes.Church of England. Details of Family: Wife, Maud Varley, living in Thornhill, Ontario.